Fixing plumbing problems in Singapore around the house is often a frustrating business as there are many things that can go wrong. For instance, you could start a flood in the bathroom or incorrectly try to fix a clogged drain. Even though it may be tempting to spend money for a professional plumber to fix the problem–and, indeed, he could in short order–you don’t always need to take this route. If you have the essential tools at home to attack the toilet clog or sink problem, you can fix practically anything around the house that doesn’t require special expertise. There are several types of plungers that you should keep around the house at all times. A cup plunger is one such plunger. Cup plungers typically have a flat mouth and are used to clear sink, tub and shower clogs. You do not want to attempt to use a cup plunger on a toilet as it is simply not strong enough to clear any clog with the toilet. The other two types of plungers include the flange plunger and the bellows plunger. The flange plunger is also referenced as the “ball plunger,” and this can be used on the toilet. The special shape at the bottom helps seal the toilet surface when you need to plunge, unlike a cup plunger. For more serious toilet clogs–and for those times which you want to skip the use of the flange plunger–you need to keep a bellows plunger in the house. A bellows plunger also is used for the toilet, but is more powerful than either the cup or the flange plunger. There are basically two types of augers that you can use for plumbing issues with the sink or toilet. The sink auger is shaped link a circular drum and should only be used on sink clogs. You can use this for either the sink or bathtub to clear clogs and get rid of other debris. On the other hand, toilets require the use of a closet auger or toilet auger. This is a specialized tool used specifically for toilet clogs. If you have one of these tools, it is no substitute for a sink auger if you’re working with problems regarding the sink or bathtub. A simple yet crucial tool that you should keep in your toolbox is the adjustable pipe wrench. Not only is it a classic symbol of the plumbing industry and plumbers in general, but it can help tremendously when dealing with stubborn pipes and getting the grip you need. Like an adjustable crescent wrench, the pipe wrench also allows you to tighten it around a pipe or other round object. The adjustable pipe wrench increases pressure on the object while you turn it, allowing you to quickly remove pipes and other fixtures. Though everyone says that duct tape fixes everything, Teflon is the go-to type of tape when dealing with leakages in the bathroom, basement or even kitchen. Teflon tape can be purchased for very little at any retail or hardware store. You can use it to seal pipe connections securely, ensuring no leakages occur. 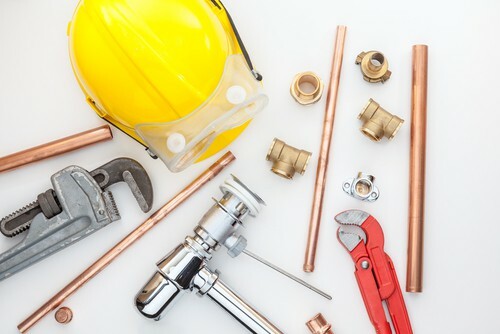 Overall, keeping a variety of plumbing tools around the house is a smart idea to ensure that you have the correct tools to fix and repair issues as they arise. From closet augers to the right kind of plunger, every homeowner should be equipped to handle common problems in the bathroom or even kitchen. This should be your first and foremost priority. It might seem like common sense, but make sure you know what supplies you are purchasing! For example, some tools are used for unclogging drains, while others allow you to fix leaky pipes. The usefulness of these tools depends on your plumbing objectives. There is a huge difference between fixing a broken drain and fixing a broken pipe, and your choices in plumbing equipment should clearly indicate this. The last thing you want is to make a pricey investment in a tool that has no purpose in your plumbing situation! Plumbing tools come with a wide array of tools and equipment. They vary in specialized shapes and sizes. These different tools are best categorized by task. For example, closet augers are useful for clearing clogs in sink drains and bathtub drains, whereas toilet augers are specially designed for unclogging toilets only. It is not only important to purchase the right tool, but you must also make sure that you buy the right kind of tool. Costs might be an issue, but buying the highest quality plumbing equipment does not have to be ridiculously expensive. As many plumbers would tell you, there are many excellent plumbing tools available at reasonable prices. All you need is the proper research and references to ensure you find the best quality equipment for your occasion. Quality is very important in plumbing tools. You certainly do not want your plunger to break apart, for example, if you intend to use it to fix your broken toilet! Purchasing is not the only option. There are many places where you can just rent plumbing tools readily at hand. This not only saves you costs, but it also frees up storage space in your household. Unless you intend to use these tools on a frequent basis, rental is probably the way to go. Keep in mind, however, that it is convenient to possess a few common plumbing devices. You never know when an emergency situation might show up. Some tools require so much skill and expertise that you need to be a professional plumber to know how to use the equipment. In fact, without the proper knowledge, you may actually harm your household appliances by using the plumbing equipment in the wrong way. It is best to consult with a professional when in doubt. Damaging your fixtures is quite possibly the worst case scenario. For those who are not acquainted with plumbing, there are helpful basic plumbing kits specially designed for novices. They contain the common devices that every homeowner should have in their possession. These devices include duct tape, a standard plunger, several adjustable wrenches, and a closet auger. They can be used for temporarily repairing the leaks in pipes and drains. For more long-term solutions, you should just contact an expert plumber to tie up any loose ends.